There’s still time to register for the 2018 Pension Focus Conference, sponsored by Pension Consultants, Inc.! 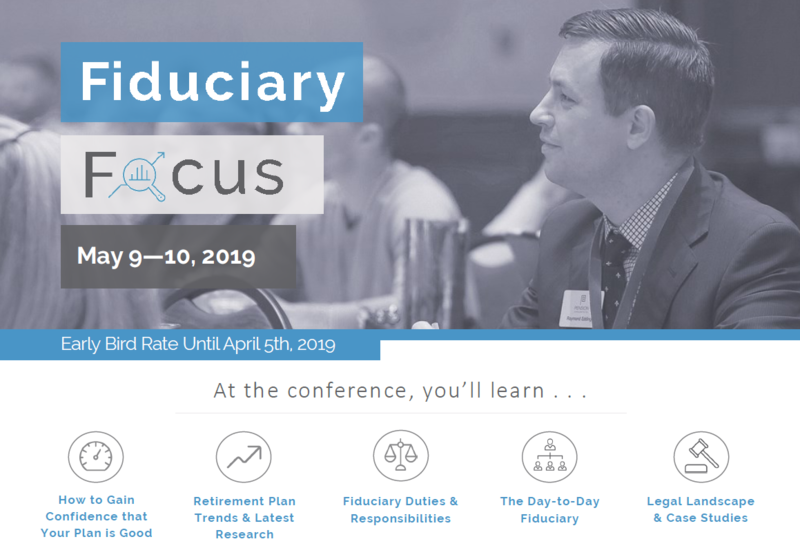 This conference is designed specifically to educate retirement plan sponsors and fiduciaries working with corporate sponsored retirement plans, helping them deliver a top-performing plan. This year’s topics were hand-picked to bring attendees timely and practical information geared toward retirement plan performance. Perspectives on performance in the retirement planning industry as a whole, current and coming trends, and the shift from subjective measures of success to objective measures will feature prominently throughout the conference, from the opening session to the keynote address. Speakers will focus on how fiduciaries can measure and better pursue performance in their investment lineup, a fiduciary’s responsibility to understand plan fees and how to optimize the fees your plan is paying, and how to use behavioral research to predict mistakes and improve outcomes in investments. Special breakout sessions provide interactive learning opportunities for attendees. Plan administrators will work through some common and emerging concerns specific to plan administration like cybersecurity, plan audit rules, and record retention. Plan fiduciaries will discuss the specific responsibilities laid out for them by the Internal Revenue Code and ERISA, finding strategies to help manage and fulfill those responsibilities and working through several scenarios with potential pitfalls. The conference will close with a roundtable discussion where attendees can ask both conference-specific and plan-specific questions and hear from conference speakers and industry experts on topics concerning retirement plan performance. To learn more about the 2018 Pension Focus agenda and conference speakers, download the conference information packet or visit www.pensionfocus.org.